We’ll provide some details and insights on some of the potential top daily fantasy defense/special team value plays for week 2. Chicago Bears – Salaries: DraftKings (DK) – 2800, FanDuel (FD) – 3500. Chicago’s salary ranks them 9th/27th on DK/FD, respectively, making them a much better relative value on FD. The betting lines with the Seahawks has the game total at 43.5 points with the Bears as -3 point home favorites on Monday night. The Seahawks’ implied team total is currently at 20.25 points and the Bears are currently at 23.25 points. Against the Seahawks last week, the Broncos’ defense logged 6 sacks, 2 picks, and a fumble recovery. The Broncos scored 12 fantasy points which ranked them 10th for defenses. The Broncos also registered 11 QB hits on Russell Wilson, ranking 3rd most. The Seahawks were held to 306 total offensive yards, ranking them 24th last week. The Bears’ defense tallied 4 sacks, 1 pick returned for a TD, and 1 fumble recovery in the loss to Green Bay. Despite just joining his new team less than a week earlier, the majority of this stat line belonged to Khalil Mack. The Bears scored 14 fantasy points to finish as the #6 defense last week. The Seahawks will be without WR1 Doug Baldwin (knee) heading into Chicago. The Bears’ defense should be a strong play on any slate involving Monday night, especially on FD. 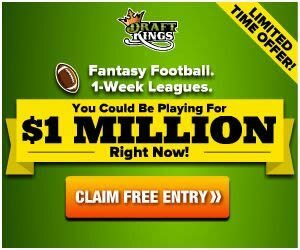 New York Jets – Salaries: DraftKings (DK) – 2500, FanDuel (FD) – 3700. The Jets’ salary ranks them 21st on both DK/FD. The betting lines with the Dolphins has the game total at 44 points with the Jets as -3 point home favorites. The Dolphins’ implied team total is currently at 20.5 points and the Jets are currently at 23.5 points. Against the Dolphins last week, the Titans’ defense logged 1 sack, 2 picks, and a kick return TD to finish as the #13 defense with 11 fantasy points, despite the loss. The Jets’ defense broke the slate with 5 picks, one returned for a TD, and a punt return TD while holding the Lions to one offensive TD and one FG. The Jets finished as the #1 defense with 26 fantasy points last week. As a home favorite with a low game total, the Jets’ defense offer a cheap play against an unimposing division rival. Minnesota Vikings – Salaries: DraftKings (DK) – 2600, FanDuel (FD) – 3700. The Vikings’ salary ranks them 18th/5th on DK/FD, respectively, making them a much better relative value on DK. The betting lines with the Packers has the game total at 46 points as a pick ’em in Green Bay. Each team’s implied total is currently at 23 points. Against the Packers last week, the Bears’ defense recorded 4 sacks, 1 pick returned for a TD, and 1 fumble recovery. The Bears scored 14 fantasy points to finish as the #6 defense last week despite the loss. The Vikings’ defense logged 3 sacks, 3 picks with one returned for a TD, and a fumble recovery while holding San Francisco to 16 points. The Vikings 18 fantasy points ranked them as the #2 defense last week. Last season, the Vikings’ defense ranked #1 in yards allowed and points allowed to opposing offenses while also ranking #4 in DVOA against the run and #6 against the pass. This unit may have actually improved their depth with their off-season transactions as well. Aaron Rodgers has a gimpy left knee after being knocked out of last week’s game for a while by Khalil Mack. Rodgers subsequently returned to rip the hearts out of the Bears with 3 fourth quarter TDs for the epic comeback win, although the knee was an obvious issue, especially affecting his mobility. The extent of the injury is currently unknown but Rodgers is expected to be a go this week. Although this play may not be for the faint-of-heart, as a one-legged Rodgers in Green Bay is still more dangerous than most QBs, the Vikings defense still present a daunting challenge to any team, and are definitely in play, especially on DK. The betting lines for this game are currently off the board. Rodgers’ availability may come down to a game-time decision. Houston Texans – Salaries: DraftKings (DK) – 2600, FanDuel (FD) – 4500. The Texans’ salary ranks them 18th/3rd on DK/FD, respectively, making them a much better relative value on DK. The betting lines for this game in Tennessee are currently off the board as QB Marcus Mariota’s status (elbow) is currently unknown. Against the Titans last week, the Dolphins’ defense logged 3 picks and a kick return TD to finish as the #7 defense with 13 fantasy points. The Texans’ defense recorded 2 sacks, 1 pick, and 1 fumble recovery to finish as the #17 defense with 8 fantasy points in the loss to New England last week. The Texans will be without CB Kevin Johnson (concussion) who was placed on IR. If Marcus Mariota (elbow) is not able to suit up, Blaine Gabbert (gulp), would fill in under center. The Titans will also be without TE Delanie Walker (ankle) as he has been placed on IR, and LT Taylor Lewan’s (concussion) status is currently unknown. The Titans could be in seriously bad shape in a worse case scenario. Expect the Texans to be road favorites when the betting lines finally come out later this week. There is a chance Mariota may not start. Sunday morning will tell for sure. WR Corey Davis (hamstring) was limited in practice but is expected to play. Betting lines have been posted against the Titans having a game total at 43 points with the Texans as -3 point road favorites. The Titans’ implied team total is currently at 20 points and the Texans are currently at 23 points. Both Tennessee starting tackles Taylor Lewan and Jack Conklin have been ruled out.